Congratulations to each of our contestants! Mr. Sanders’s winning essay is printed below. Grandpa was a Freemason? I never met my grandfather, but my dad misses him a lot and reminisces about him all the time. When my social studies teacher invited us to write an essay about Freemasonry’s influence on American culture, little did I realize I was about to find out another piece of who I am. My dad has always talked about how Grandpa was trying new things, trying to make himself a better person, was involved deeply with his church, and fought for his country on Leyte Island in the Phillippines and in Papua New Guinea during WWII. Now, as a result of this essay prompt, I found out that Grandpa Sanders was also a Freemason and a Shriner, and Dad showed me the delicate worn box of my granda’s lapel pins and told me what he knew of the Freemasons. Other than a brief mention of the Masonic Order and the Anti-Masonic party in my United States History text, Freemasonry was never covered in any of my Social Studies classes, so I decided to find out more about who the Freemasons were and what they did for the United States. Washington, as well as other early leaders in American Freemasonry, rejected a European past where overreaching authority regulated how one could exchange thoughts and ideas. This view is embodies in one of the greatest symbols associated with Freemasonry: the all-seeing eye, representative of an omniscient God, aware of, but not controlling the activities of men. Although similar to the “eye of providence” (found in a triangle, overlooking an unfinished pyramid on the back of the one-dollar bill, as the Great Seal of the United States), the Great Seal is not of Masonic origins. However, the Latin maxim that surrounds the unfinished pyramid of the Great Seal — Annuit Copetis Novus Ordo Seclorum — can be roughly translated as “God Smiles on Our New Order of the Ages,” and is consistent with Masonic philosophy. The pyramid, representing man’s worldly achievements, or perhaps the United States, is incomplete without God’s blessing. As Freemasons believed, the union of God and man was required to break the religious order of Europe and begin a renewed search for the universal truth. Masonry embraced the new idea that was being born in America, that individual thought and free will were superior to governmental dictates and denominational affiliation. At the time of the country’s founding, and later during the Civil War, Freemasonry continued to promulgate the dignity of man and the liberty of the individual. As such, the Freemasons were a pro-abolition society. As early as 1777, the fraternity made pro-abolition petitions in Boston. During the Civil War, the Freemasons, although at times separated by the color of their uniforms, remained true to their values and brotherhood. There are many stories of wounded soldiers, taken by both the North and the South, who were treated and cared for as if they were a brother. The strength and beliefs of the fraternity held more power than the governments to which they had pledged allegiance. With the passage of time, Freemasons continued to influence American ideals and culture. Throughout the 1800s and into the early 1900s, before the United States formed social “safety-nets,” the Freemasons established orphanages and provided homes for widows and the aged — a form of “social security” — providing meals, clothing, and health care. To this day, Masonic Homes offers housing and services to individuals and families, and Masonicare provides nursing care and other services, regardless of the individual’s affiliation or ability to pay. Masons remain devoted to social betterment through individual involvement and philanthropy, but also continue, as a fraternity, to prioritize personal study and self-improvement. Discovering that many of the “founding fathers” of our nation had Masonic ties made learning about that period of history more personable and relevant. I have a clearer understanding of how these men were connected and came to be united in cause. Over the course of the history of the United States, Freemasonry has strengthened America and reminded her of its original founding principles and ideals, as well as maintained its commitment to the individual’s pursuit of purpose. It is not overly presumptuous to suggest that Freemasonry played a significant role in establishing America as a place where the spiritual search, and man’s pursuit of liberty and purpose and the common good, would be protected from oppressive political systems and ridicule from other groups. Over the centuries, Freemasonry has transformed itself into a global fraternal association. While the typical American may be fascinated merely with the symbols and secrecy of the Freemasons, it remains a goal of the Freemasons “to instill in the hearts of men, ideals for a better tomorrow.” That goal has been and will continue to be Freemasonry’s most significant contribution to American culture. Grandpa Sanders succumbed to cancer in 1990, at age 65, well before I was born, but I believe that the pursuit of knowledge, the betterment of self, and his search for spiritual answers are among the reasons that my grandpa became a Freemason — pursuits which are still pertinent to and influence American culture today. This evening Elvin E. Helms No. 926 was pleased to have in attendance some visitors from Cox No. 464 and Mizpah No. 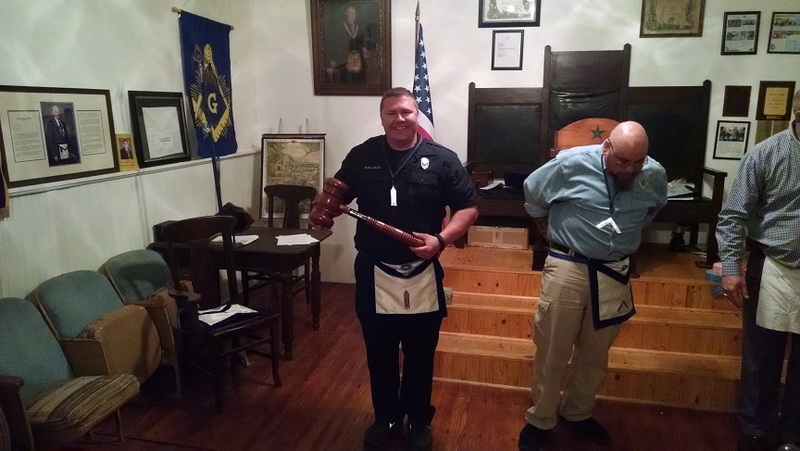 507 along with the Grand Master’s Traveling Gavel. As intended, we did not keep the Grand Master’s Gavel for very long. 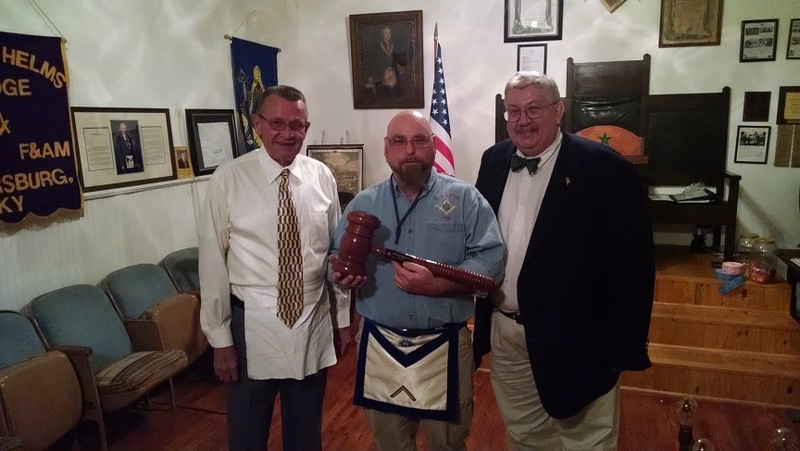 Brother Craig Lindon had claimed the gavel at James W. Alley No. 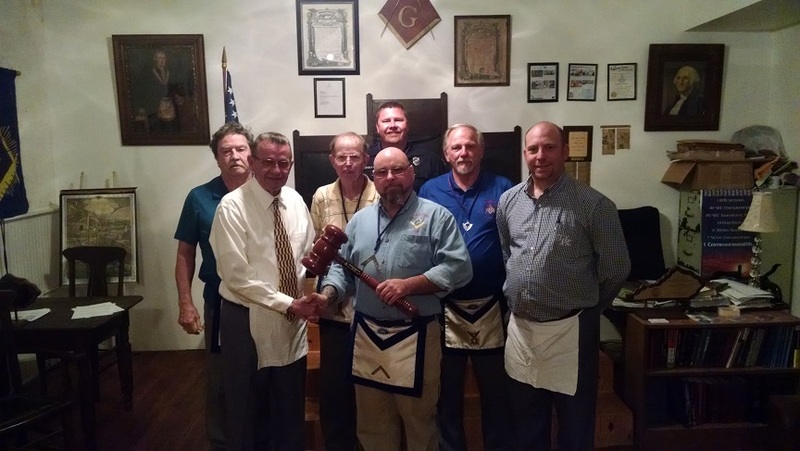 869 on May 11th and then presented the gavel to Elvin E. Helms No. 926 on May 12th on behalf of Pieratt No. 725. 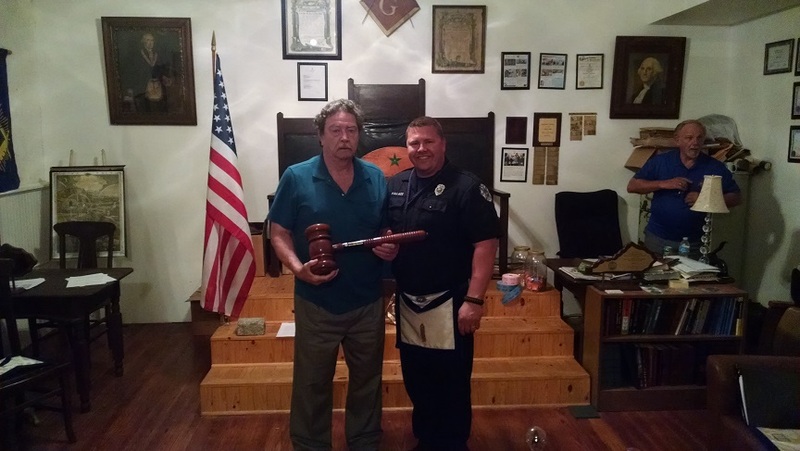 Brother Gary Rose claimed the gavel for Cox No. 464. Pictured above, left to right: Buddy Wallace, Gary Rose, Ernie Stratton, Travis Bush, Jason Wallace, Ed Tanner, and Craig Lindon, Past Masters all. Father and son Buddy and Jason Wallace pose with the Grand Master’s Traveling Gavel. Brothers Gary Rose, Travis Bush, and Dan Kemble pose with the Grand Master’s Traveling Gavel. 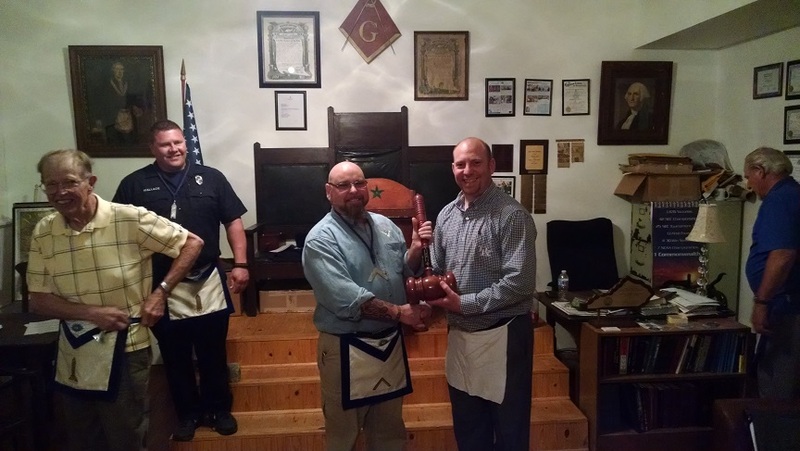 Worshipful Master Travis Bush hands off the Grand Master’s Traveling Gavel to Brother Craig Lindon of Cox No. 464. Brother Jason Wallace posing with the Grand Master’s Traveling Gavel. He did not want to let it go. Eventually we had to hold him down and take it away from him.